Nick Hengen Fox, a full-time faculty member at a community college, talks about the connections between successful union organizing and the classroom, radical teaching practice, and what “critical university studies” might look like outside of a university. CW: Could you say a little about how you’ve become involved in radical organizing around universities? Nick: In grad school I got involved predominately through union stuff—through working with the Emaciated Gopher, GSWU (Graduate Student Workers United), and ultimately UAW during the most recent union drive at the University of Minnesota. But that was happening at the same time as all the stuff around the Rethinking, Reworking, and Beneath the University conferences at the U of M. Also, at that time too, I read Bousquet’s book How The University Works. It all sort of came together for me, because when I had gotten my Master’s Degree and paid for it, I had written some pieces about how that seemed really exploitative. All that stuff in the world of critical university studies kind of drew all of that together for me. CW: Do you want to say more about what kinds of organizing you have been involved with in the university? Nick: Sure. The thing that I’ve done the most work with was grad student organizing, starting at the fundamental level where we didn’t have any kind of organization, but really needed one. That was the Emaciated Gopher. We were meeting with a small group of people, from five to ten people, talking about how we would organize 4,700 grad students, growing that group to twenty or thirty core members (when we became GSWU), and moving all the way through recruiting a national union to run that campaign. That was like two years of work. I really valued grad organizing because it seemed, if what I was seeing was this kind of inequity in the structure, it was one of the most obvious ways to change the inequity—to change the terms and conditions of employment for graduate workers. CW: How have your views on organizing changed through the course of that experience? What happened in that campaign and what did you learn through that? Nick: It was frustrating. 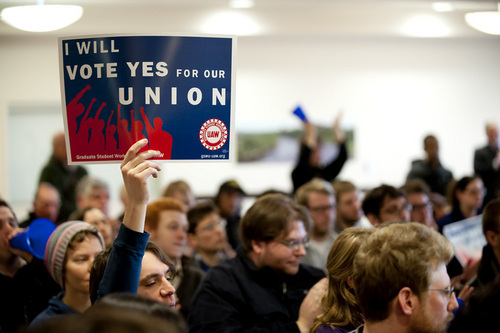 The union was ultimately defeated in an official vote. And pretty resoundingly. At the start, I was really, really excited and optimistic about what a grad union could do, and I think I was for the most part pretty realistic. Those early meetings—eight people, ten people, many of us IWW members or pretty far left—it was an amazing community, and one that really got me through grad school. But it was clear that we would need more support to actually win a union. And despite the loss, I still think that was the right analysis. But my experience with the business union was incredibly restrictive, in terms of their approach to organizing and building relationships. My concern with both of the unions we worked with was how well—poorly, I mean—they understood the culture of graduate school. The apprenticeship model, the ‘you have it better than other people’ kind of class discourse from the university, I mean. And that has to be changed before you’ll ever really succeed at organizing on the ground—except among people who already have affinities for unions or left movements in general. And I think the failure to really deeply understand—and, more specifically, to transform—that really fucked up culture is why our campaign couldn’t succeed. CW: What do you think it was about the business union, the UAW, or business unions more generally, that made them acceptant of the culture, and not willing to try to change it? Nick: I think, from their perspective, that’s an insurmountable task. I mean, because their mode of organizing is to organize around a school year (or, maybe, if they must, two school years) to get a vote. And I think that that mode of organizing is too transparently transactional to appeal to a lot of grad students. A lot of grad students are just like, ‘you just want me to vote so you can get my dues.’ I don’t think that’s true, but that’s what they see. And so, to win them over, you’ve got to invest more time and resources and energy into actually organizing—as in changing people’s mentalities about work. And, based on my interactions with big business unions, I’d say that’s unthinkable to them: too much money, too much time, too much training of local organizers, too much shifting from their already established union culture. But, on the other hand, when you’re talking about a place like the University of Minnesota, I still can’t imagine how a solidarity approach could do it. Because it’s just so huge, it just would take such a big network to successfully organize there. Anyway, because business unions’ work is not radical, I think they’re constitutionally incapable of investing in that kind of cultural change. CW: One of my other interviewees had a critique of the UAW as adhering to a kind of liberal Leninism. It has the worst of both worlds: liberal adherence to Democratic Party politics while also having a kind of bureaucratic, top-down Leninist approach. Nick: Absolutely. And I’m not deeply opposed to Leninist ideas, but I just think that you can’t be trying to organize people who spent most of their lives thinking they’re smarter than everybody else by acting like you know more than them. Which is what I saw a lot in my interactions with UAW staff; emphasizing quick conversations, emphasizing simple, on-script answers to questions. This idea that they—paid staff—were always in control and that they were always running the room, whether when organizing or in meetings with “activists” like me. And it was like, ‘I see what you’re doing.’ I want to be clear, I think this approach is particularly problematic in grad schools. All of the successful organizing I’ve seen has to do with people building more than just transactional relationships. Like the people that we moved into our organization prior to the UAW arriving. Those were people who were moved by ‘oh, these people care and they have these ideas, and they recognize how we might improve things for us.’ I think about times where we’d sit down with folks who hadn’t thought about unionism at all and have a half-hour conversation, and they’d be like, ‘oh! This is what we need!’ because we listened to them and helped them think about solutions to their specific problems. And there’s just no room for that in the UAW model, even for people who you’d want to be your ‘activists’ (to use their term). It’s too much investment. The idea of spending time with people is just antithetical to their idea of organizing, which is deeply ironic. CW: Somebody was saying that in other kinds of campaigns, such as with SEIU, they like to have one organizer for every ten union members. And that organizer builds deep relationships with those people. While the UAW’s ratio is one for every four hundred. Nick: Yeah, on our campaign I guess it would have been one for every 350 or 400. I hadn’t thought about it that way. Wow. CW: Transitioning to talking about your approach to teaching, thinking about how the UAW and business unions generally conceive of education: Considering the way that they dealt with the organizing committee who brought them in, they seemed not to value the knowledge that the committee brought to the organizing situation. It was like they were the educators. 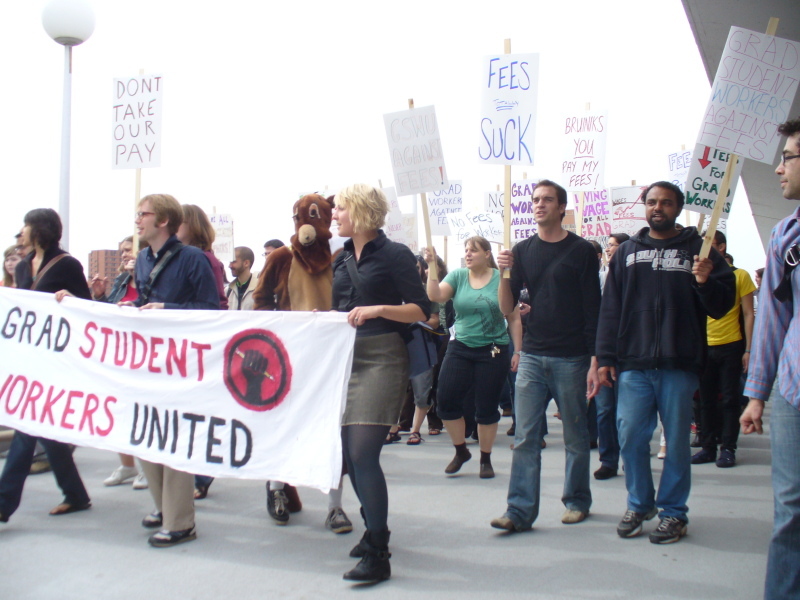 Their approach to spreading their view of what a union should be, or what a union could do for people, seemed antithetical to a kind of radical pedagogy approach, where the teacher sees students as bringing their own knowledge to the learning situation, and they try to create a radically democratic situation within the classroom. So, I always do these assignments with my students. For instance, manifestos. My composition students have been doing research on a topic all term, and now they wrote these manifestos—obviously a form that has a certain political meaning. So they write these manifestos and I’ll say something like, ‘ok, you get extra credit if you make your manifesto public.’ In the past, I’ve said, ‘if you publish it in ten places, I’ll give you whatever points.’ Obviously, giving extra credit is a weird feature, but it’s a motivator. And what I think that does is it sets them up to think about the work they do as engaged. It’s not just an assignment they do and turn in to their teacher and never think about again. But, it’s like, ‘well, what does it mean to write something’–and then, like, put copies of it up around campus? Or even on your Facebook? CW: How do you feel that most of your students take these assignments? Do they take them more seriously? And how often do they try to publish them? Nick: This time? Three or four or five students said, ‘oh, I’m gonna do that for sure.’ And I have forty-eight or forty-nine writing students now. So, maybe ten percent. Maybe that’s setting low expectations, but for me, if ten percent of my students are engaging in something beyond the classroom, that’s really positive. And I guess I should say, too, that I teach at a community college. So, my students’ do not always have the leisure to engage in activism. A lot of my students work fifty hours a week and/or have kids and/or family members to take care of. So, finding the time to go and post five copies of their manifesto (or pay to make five copies!) is not always an easy thing for them. So, I think that’s part of it, too. As you know, activism costs a lot in terms of time. CW: Are there any other radical pedagogy approaches you’ve tried? I remember a while ago you gave a presentation about a class you taught where you got students to think about their own positions in universities. Could you say more about that? I was really happy, this year, when I was reading the evaluations that they did relating to that activity. In the formal evaluations at the end of class, there were these political economy infused statements, like, ‘this classroom is bad for my learning.’ They were critiquing the situation, rather than the class. They were supposed to obviously reflect on me, but they were saying things like, ‘if this classroom had more windows, I’d be able to learn better.’ So, I’d like to think I’m seeing these little transitions to thinking critically about their own experience. CW: Have you thought about ways you could use the space and time of your classroom, and the requirements that students have for the class as opportunities for them to do organizing? I guess you already started doing that with the manifesto publishing assignment. Nick: Yeah, it’s something I’d love to think more about. There are two key questions there, though. One is how do I evaluate that type of work, because you have to at some level evaluate it? Two is what kind of responsibilities do I have to the students in terms of what they need to learn to go on in college? And I guess I should say, too, while I have students write manifestos and publish things and do op-eds and write letters to senators, I also teach research-based academic writing, because if they don’t learn how to do that they’re not going to pass their future classes. So, I think it’s really important to do both. I’m not so deluded as to think that knowing how to use an academic database for research is a fundamental life skill; but I think I would do them a disservice not to help them learn how to do that in terms of them getting a college degree. CW: I think this speaks to one of my questions about the tensions that you have to grapple with between trying to infuse your radical politics into your teaching while also working within universities, where students are paying tuition to learn skills, etc. Along with learning those skills they’re also being disciplined and categorized through grading and getting credits towards graduating. Have you thought of any ways to reduce the sort of capitalist reproduction effect of education in your classes? Nick: I’m not—this won’t sound very radical—opposed to students being part of capitalist reproduction, because many students need to find ways to sustain themselves. Let me give you an example. There’s a big Intel microprocessor plant in Hillsboro where I teach. So, we have this one-year certificate, where students come and take ten classes, with six of them taught basically by Intel people—not PCC faculty. They get this certificate from PCC, and then they are guaranteed a job at Intel. On the one hand, the university politics guy in me thinks, ‘oh, what a messed up deal they cut with Intel.’ But, on the other hand, I’m meeting with these students who are like, ‘well, I’ve been sleeping in my car for six months, so I just thought, I gotta get this eighteen dollar an hour job at Intel.’ And it’s like, who am I to say you shouldn’t do this? I want to help students get tools to help them survive. And I’d like to think that I succeed in doing that while also showing them the problems of those tools. But, in a broader sense of your question, I don’t know. I think it’s the working within rather than the working to destroy, or maybe to destroy from within long-term? CW: That reminds me, in our interview with Tim Stallman from the Counter-Cartographies Collective, he talked about projects they did around the Research Triangle in North Carolina, counter-mappings where they made tools for students and community members to become more aware of where people are working, what people’s status is as workers. Could something like that be useful for where you are? Nick: It would be. I would say, though, I think my students are often so far away from that kind of work in fundamental ways. My students know how to talk about their own experiences, but I think the idea of doing that kind of collaborative or co-research is really difficult. Students just disappear. I have students who start working on projects together and then suddenly, half the group is gone. As you probably know, retention is a huge issue at community colleges. CW: Yeah, it seems like it would be really tough for community college students to take any sort of leading position on that. This is actually something I was talking to Tim about, that the skills for doing that kind of counter-mapping are difficult to acquire. Tim was saying how he and the other counter-cartography people, who have those specialized GIS and graphic design skills, want to develop workshops for sharing those skills. Ideally, we could fly in some of those folks and have them put on a week-long collaborative mapping project, working with them and using our connections with universities to get money to bring them in. For me, that ties together a lot of the questions that I’m grappling with now—even about the fundamental language of what we’re talking about here. I’ve found it really hard in the last year not to talk about questions like this as, like, ‘university struggles’ but as ‘higher ed struggles’ or ‘college struggles.’ Just to change that word choice, I mean, so that it focuses the critique beyond the university where more than 50% of higher ed is happening. CW: Yeah, we still have a university-centric view on the politics of higher education more broadly. That reminds me of a mistake we made in organizing the Beneath the U conference: not being in coordination with the radical undergrads who were organizing a hip-hop conference at the same time. That was something that brought in students who were pretty radical and also non-students who are excluded from higher education. In community colleges, it seems like the impetus for radical struggle is probably not going to come from faculty. But, I wonder if it can come from students. I remember in hearing about the California movements, there were some community colleges that were really involved in the struggles, such as Laney Community College in Oakland. What we can do as faculty is to take the lead from students, and to mobilize resources from our colleges, so we can create spaces and times where students and young people who are excluded from higher education can get together and organize. Maybe this goes back to the off-campus vs. on-campus organizing question. If we look at movements in the country today, such as Occupy, even though that might have come partly from university occupations, it’s mostly happened off of campuses. Nick: That definitely was a thing that came up in a lot of my classes too, whether I brought it up or my students brought it up. That in a way is a meaningful link, and the fact that the student loan issue was coming up so much in the context of Occupy was really good, and suggests one of the fundamental links between the two. I think that’s a really hard question. That’s the part where I am still trying to figure out: what’s the next step for me? How do I facilitate those connections? Nick Hengen Fox is a professor at Portland Community College. He recently published an essay in Radical Teacher called “Teaching (is not) Activism.” Our interview was conducted on 5/28/12.